Competencies are the skills and personal characteristics that enable people to achieve superior performance. Competency-based assessment and development processes are designed to improve people’s productivity and effectiveness by strengthening competencies that facilitate superior performance. These processes may also be used to prepare people for the next job in their career by developing competencies that will be needed in that job. The needed competencies are identified in job competency models, which are the foundation for effective talent management that enables an organization to attract, retain, and develop the right talent. After a talent strategy, competency framework, and competency models are created, the next step is to assess the competencies of the current workforce and the organization. Competency assessments are key! Accurately assessing a person’s competencies determines the quality, validity, and usefulness of every human resources application that is derived from assessments, including development, succession planning, and performance management. If a competency model includes behavioral indicators, a competency assessment survey can be developed based on three to seven behavioral indicators per competency. Typically, there are four or five items per competency. The items may be grouped by competency or presented in random order. 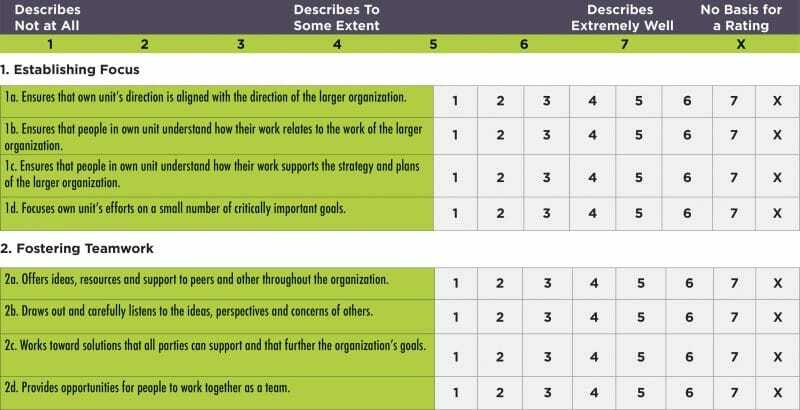 Rating scales may be based on various dimensions, as illustrated in the table below. Because most raters limit their ratings to the upper portion of whatever rating scale is used, we recommend using at least a four-point rating scale. In our experience, raters are more willing to use a wider range of a rating scale if the scale appears less evaluative, as are the rating scales based on frequency and descriptiveness from the table on the preceding page. Here is an example of how the first few items of a survey can be formatted. To what extent does each behavior describe the person you are rating? Use the following rating scale and circle one number opposite each behavior. What are two or three of this participant’s strengths? What could this person do to increase his/her effectiveness? This option is easy to implement. Each participant completes a self assessment, and each participant’s manager separately assesses the participant. The participant and manager then meet to compare and discuss their assessments and agree on several areas to target for development. We do not advise using only a self assessment, because we have found that many persons are unable or unwilling to assess themselves accurately. It is important and useful for people to get feedback from others. In multi-rater feedback surveys, participants are rated by multiple persons. The term, “360 feedback” is used when the feedback comes from all directions (e.g., from the participant’s managers, peers, direct reports, and internal or external customers). Because of its richness and power, and the ease of computerized administration and scoring, 360 feedback has become widely used in the past decade. For several reasons, we recommend implementing 360 feedback only with the assistance of external consultants. First, trained professionals can help participants understand the feedback, which usually includes item scores from each rating source, competency scores from each rating source, and frequency distributions of ratings. Second, because the feedback can be surprising and upsetting for some participants, it is important to have qualified staff available to help participants understand and manage their reactions to the feedback. Third, having external consultants receive and process the surveys helps ensure anonymity for participants’ direct reports and peers, who might otherwise be reluctant to provide honest ratings. External consultants can also help the organization make and implement policy decisions about who will have access to feedback reports and whether the reports will be used as part of other talent management programs, such as performance appraisal and succession planning. Decide who will have access to feedback reports or summaries of them. For some technical competencies, formal tests are available that are administered by organizations that offer training and certification. For example, tests are available to assess proficiency in typing, foreign languages, programming languages, and in selected areas of finance and accounting. An assessment center is a program in which a group of participants completes a variety of activities such as an in-basket exercise, role plays, group simulations, case analysis, and various tests. A set of trained raters observe the participants during the exercises and assesses them on the competencies. At the end of the program, which usually runs for one to three days, participants receive a feedback report summarizing the competency assessments and scores on all activities. Because it is costly to develop and implement assessment centers, they have not been widely used in recent years. The interview might include 5 to 10 “event” questions like this. The interviewer uses a probing strategy to learn what the interviewee did, said and thought at key points during the situation described by the interviewee in response to the event question. The interviewer also asks about the outcome of the event. After the interview, the interviewer “codes” the interview by assessing the amount and quality of the evidence for each competency. The interviewer prepares a feedback report and may hold a one-to-one feedback session with the participant to review the feedback report and help the participant begin to plan his/her development based on the feedback. Because of the high-level of skill required to conduct this type of assessment, it is usually done by external consultants. Behavioral Event Interview assessments require a day or more of a consultant’s time to conduct each interview, code it, prepare a report, and meet with the participant to review the report. The power of the data from this type of assessment may justify this approach, especially if the participants are senior leaders. The Structured Event Interview is a simplified type of Behavioral Event Interview developed by Workitect to provide many of the benefits of Behavioral Event Interview, while significantly reducing the time and cost required to conduct and analyze the interview. This interview takes about one hour to conduct and focuses on three accomplishments, each of which is related to performance of a different main responsibility. The Structured Event Interview Protocol includes both “event” questions and specified follow-up questions that guide the interviewer through the process of probing each accomplishment. The protocol includes spaces to capture key information in response to each specified question.